Significant opportunity exists for commercial property, but in these changing times, your client wants to understand clearly and simply what asset risks could lie in wait. This means an even handed approach to environmental due diligence ahead of site acquisition to fully understand a site’s history. Your client needs a realistic assessment of how significant any contaminative risk really is or the likelihood of any potential remedial work before occupation. It also means assessing, flood risk, infrastructure and subsidence issues that could affect land value and site operations. Business continuity is the key. Our concise reports, backed with a robust expert opinion with full reliance, address key market sector needs with solutions that keep the transaction on track. Our FCI Commercial Report provides business owners with a summary of any potential environmental risks that could interrupt business continuity or affect trading. A simple, best value screener that is most suitable for more straightforward transactions with retail and high street office premises. Investing in or relocating to new commercial premises is a big financial commitment. Understanding the potential environmental risks in the locality, including local community receptors, infrastructure and air quality impacts which are vital considerations for business managers. 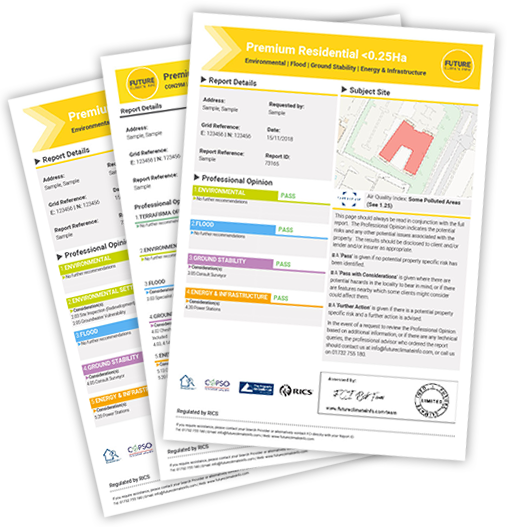 The FCI Commercial Report delivers a comprehensive analysis that provides clarity in choosing the optimal location. The Government is seeking imaginative solutions to overcome obstacles in the planning and financing of brownfield projects. To meet this opportunity, commercial property lawyers and their clients must decisions based on straightforward environmental risk data, backed with expert opinion. The FCI Commercial Report assesses the risks to support a more rounded view on site viability. A unique ‘off the shelf’ contaminated land insurance scheme for commercial properties. This innovative product enables cover without the need for a bespoke referral process, saving time and maintaining momentum in the transaction. We partner with JBA Consulting to provide a range of cost effective solutions that assist with commercial property and land transactions where flood risk is identified in an environmental search. With Future Climate Info, you have access to one of the very few SILCs (Specialist in Land Condition) in the UK. Chris, supported by a specialist team of solution providers, is available to offer his expertise to help your client unlock the true potential of specific brownfield sites they are identifying. Penny is a Chartered Environmental Surveyor and a Chartered Environmentalist. Her work has involved a large number of contaminated land investigations and applied her specialist knowledge to bespoke environmental insurance underwriting. Tim’s background is in environmental consultancy, having worked for many years delivering risk assessments where land or property is being transacted or developed. He has extensive experience of advising clients on operational risk reduction and mitigation, through environmental audits and inspections of commercial and industrial processes. He has worked on a multitude of projects, from complex property portfolio transfers, through to the design and implementation of Preliminary Risk Assessments (“Phase 1”) and Geoenvironmental Intrusive Investigations (“Phase 2”) for the purposes of both small and multimillion-pound development projects. He has direct experience from the perspective of a regulator, in his capacity as an outsourced Local Authority Environmental Health/Contaminated Land practitioner. Tim also holds expertise in the value of other transactional services such as environmental indemnities, through his work as both a broker and underwriter of environmental insurance.